If you thought a four-leaf clover was the luckiest clover you could get your hands on – think again. Then, quit thinking about it and go get yourself some red clover. In recent red clover studies, the plant has been found to be the most abundant source of isoflavones, a plant-based chemical that acts like estrogen. But this herb can be used safely by both men and women and has a number of different health benefits. 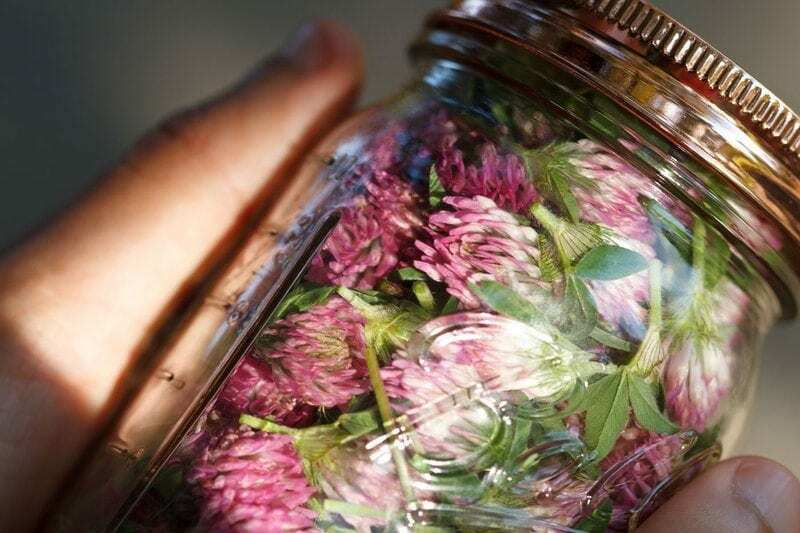 You can buy red clover in capsules, as a tea, or in bulk as a dried herb. Red clover is from the legume family and isn’t just good for humans – red clover performs nitrogen fixation which means, when planted in your garden, this plant helps the rest of your garden grow! So what else can red clover do for you, other than make the herbs and veggies you’re growing even better? Red clover is the herb with the most phytoestrogens, which are very similar to human estrogen from a chemical standpoint. This plant-based compound is easily digested and used in our bodies to regulate hormonal imbalances and even help prevent cancer. if there is too much estrogen present in the body (such as women before reaching menopause) the phytoestrogens attach to estrogen receptors and prevent the natural hormone from overproducing. When natural estrogen levels are too low (women during menopause) the phytoestrogens take on the role of raising and balancing the natural level of this hormone. A study at the Harvard Medical School shows that low levels of estrogen affect men as well. Red clover helps to defeat estrogen deficiency which can cause depression, lack of energy, weight gain and insomnia in the form of anxiety. Red clover has been seen to lower the risk of “mid-life crises” in men. Red clover, taken daily, can improve and strengthen your bones, lower inflammation and promote dilation of your veins to encourage blood flow, improves your skin, mood, sleep, and even naturally lowers bad cholesterol. What else does this wonderful plant do for you? Blood-cleansing effect – removes toxins from your system. Protects prostate – improves and strengthens prostate function. Protects against cardiovascular diseases – by lowering cholesterol, red clover will keep your heart healthy, your bones healthy, and improve your weight loss drastically. Controls calcium deposition of bones. This great herb actually has a ton more uses. Now that you’ll be getting more red clover into your life, do you feel lucky? Its phytoestrogens will help balance hormonal deficiencies, its anti-inflammatory and antiseptic properties will help to clean your veins, heart, and other internal organs, its anti-cancer properties kill free radicals and protect against bone, heart, breast and prostate cancer, and it helps strengthen brittle bones associated with menopause. So do you feel lucky? We hope so. Do you have any great health topics you want us to write about? Share with us in the comments! And thanks for reading.